These issues have received increased global attention. But simple attacks on ‘tradition and culture’ just fuel the backlash to women’s rights. 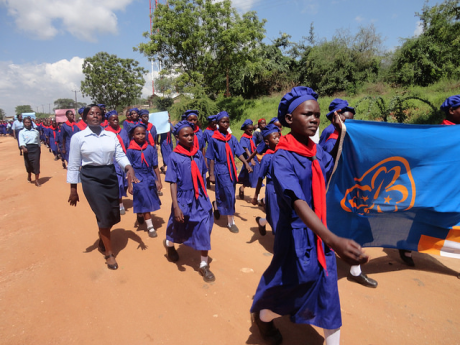 Kenya Girl Guides Association rally against FGM, Kenya 2011. Photo: UN Women/Kenya Girl Guide Association/Flickr. CC BY-NC-ND 2.0. Some rights reserved. Campaigns to end female genital mutilation (FGM) and child marriage have received renewed support and funding from diverse global actors over the last five years. Despite commendable progress towards ending these harmful practices, challenges remain. For instance, many countries with high rates of FGM and child marriage still do not have laws banning these practices, including Somalia, Sudan, Liberia, Mali and Sierra Leone. Even in countries with these laws, a backlash has hampered efforts to eliminate them. In the past year, religious freedom arguments have been invoked in US and Indian courts to defend the practice of FGM. In January 2018, a Kenyan doctor filed a case seeking to legalise FGM, claiming that her country’s ban on the practice since 2011 is unconstitutional. She argues that adult women in particular should be allowed to do what they want with their bodies and that banning FGM is tantamount to embracing Western culture and casting local practices as inferior. This case is ongoing. Meanwhile, many in the West still seem to engage with FGM in particular as a ‘white woman’s burden’, whereby African girls need to be rescued from ‘backward culture.’ Though not all communities in Africa practice FGM and are culture and tradition really the main drivers of such harmful practices? Too often, culture and tradition are invoked to perpetuate human rights violations, as many shy away from attacking other peoples’ cultures and traditions. This leaves fertile ground for abuses to continue unpunished. At the same time, arguments resting on culture and tradition provide a moral ground for others to claim their actions are aimed at ‘saving poor girls and women’ from ‘backward’ cultural and traditional practices of their communities. This, of course, has neo-imperialist undertones. What’s too rarely acknowledged is that harmful practices like FGM and child marriage are deeply rooted in the unequal social and economic relationships between men and women: a system that subjugates women and girls, while privileging men and boys simply referred to as patriarchy. Culture is not static. The cultures of diverse groups have changed over time, adapting and reforming certain hazardous aspects without giving up other harmless, positive and meaningful ones. The global attention FGM and child marriage are now receiving will only transform unequal power relations between women and men if we apply the antidote to patriarchy: a human rights approach. Harmful practices are violations of human rights to dignity and health, including sexual and reproductive health; personal security and physical integrity; and freedom from torture, and cruel, inhuman or degrading treatment. Girls subjected to them are often denied rights to education and forced to drop out of school, contributing further to women’s social and economic powerlessness. FGM and child marriage are forms of discrimination and violence against women under universal human rights. This perspective overcomes the perception that interventions to end harmful practices are ‘neo-imperialist’ attacks on particular cultures. It also places responsibility on governments who have duties to ensure the human rights of all persons in their jurisdictions. 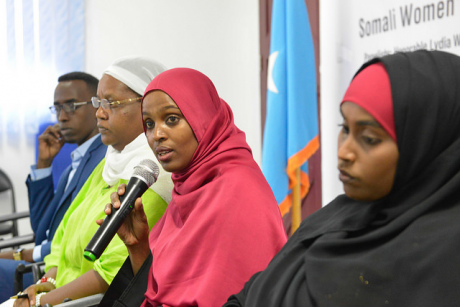 Ifrah Ahmed, a Somali anti-FGM campaigner, speaks during an FGM conference, Somalia 2016. Photo: AMISOM Public Information/Ilyas Ahmed/Flickr. CC0 1.0. Public Domain. Crucially, aims to challenge harmful practices must be situated firmly within the context of broader efforts to address the social and economic injustices women and girls face the world over. These must not be isolated single-issue struggles. Adequate resources are needed for prevention, protection, and provision of services, as well as partnerships and prosecutions where required. Protection services can support high-risk girls, including through shelters or alternative care and telephone hotlines staffed by trained counsellors. Education, information, life skills and livelihood training and health service programmes can meanwhile empower girls and women to assert their rights and make informed decisions. Public education and awareness-raising can transform underlying patriarchal social norms, attitudes and beliefs. Laws and policies banning FGM and child marriage send an important, clear message that states will not condone harmful practices. States must guarantee girls and women equal protection under the law, including access to legal remedies and possible reparations, while strengthening the ability of state and non-governmental agencies to protect those at-risk. Adequate resources and training for professionals in health, education, social work, judiciary, police and other sectors is vital to transmit accurate information about sexual and reproductive health, better implement legislation and punish perpetrators, and increase support for survivors to access remedies and services including medical, psychosocial and livelihood assistance. States must be held to account on their international obligations to protect women and girls from all forms of violence and discrimination. Diverse groups must be targeted and mobilised to end harmful practices, including, but not limited to: women, men, boys and girls of all ages, traditional and religious leaders, civil society, health professionals, universities, media and practitioners. In particular we must support those running prevention and protection programmes at the grassroots level where the transformation of social norms is critical to ending FGM and child marriage. A joined-up, comprehensive approach, based on human rights is the only way we can challenge the patriarchal structures that are the key drivers of such harmful practices. A simple attack on culture and tradition only fuels the fire of the backlash to women’s and girls’ rights globally.